The Facebook Like button celebrated its 1st anniversary this week, on April 21st. It’s ubiquity makes it hard to believe that it was a little over a year ago when Mark Zuckerberg took the stage at the third annual f8 Developers Conference to announce the button, which is now integrated with around 2.5 million websites worldwide, with 10,000 new ones being added daily. While the anniversary of the conference came and went with nary a peep from Facebook, judging by this “f8 partnerships” Facebook Group, there will be an f8 in 2011 (Facebook has confirmed). 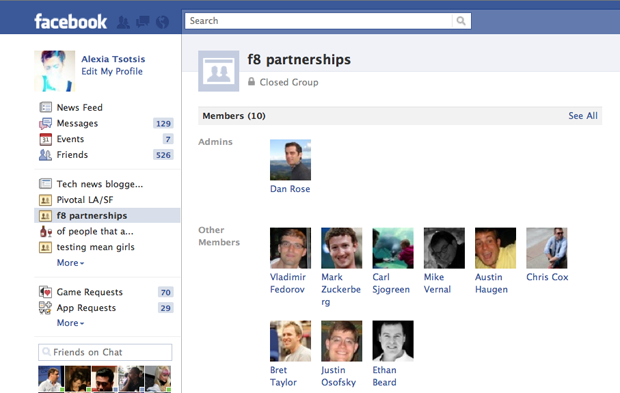 It’ll be interesting to watch that “f8 partnerships” page in the coming months, to see who, if anyone, gets added from outside the company. Up until now the f8 scheduling has been somewhat erratic (missing 2009 entirely). There have been a total of three f8s so far, the first one happening on May 24th, 2007, the second happening on July 23rd, 2008 and the third one happening between April 21-22 in 2010. In the meantime Facebook has grown from 24 million active users to almost 700 million. While the conference typically happens in the summer, Facebook has yet to confirm an actual date for 2011 saying only that it’ll keep me posted. Judging by this year’s latency in announcement time, it’s probable that it will be held in late summer, I’m guessing sometime between July and August. As AllThingsD’s Liz Gannes reports, Twitter has elected to shelve its Chirp conference this year while Google is once again over achieving with a sold out i/o in May. If developer conferences were like college, Facebook would be like the brilliant student who turned in their work late, but turned it in beautifully.